What Will Happen If You Are Exposed to Mushroom Spores? While life on Earth could not survive without the sun’s life-giving radiation, this constant bombardment of energy has its side-effects as well. Exposure to sunlight can provide health benefits, but overexposure can lead to life-threatening health problems. Carefully managing your exposure to solar radiation is a key part of maintaining good health. Humans require between 1,000 and 2,000 international units of vitamin D daily for optimum health. Your skin creates vitamin D naturally when exposed to solar radiation, and spending 10 or 15 minutes a day outside can give you all your body needs to stay healthy. If you cannot spend time outside, or if you live far away from the equator where sunlight is more diffuse, you may need to supplement your vitamin D intake with tablets or fortified foods to get the dosage you need. Sun exposure can also improve certain skin disorders such as psoriasis and vitiligo. The ultraviolet radiation present in sunlight can also cause damage to your skin. 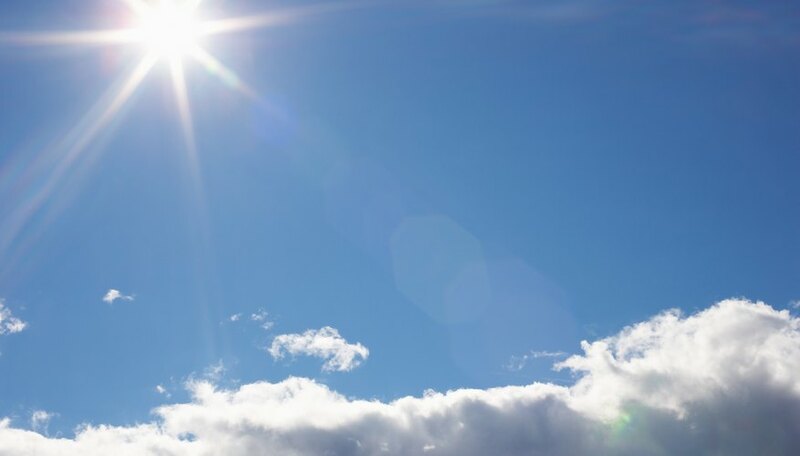 Short exposures to intense sunlight during the summer months can produce painful sunburns, while longer-term exposure to UVA and UVB can damage cells, altering their DNA and possibly leading to skin cancer. The American Cancer Society recommends the use of sunscreen whenever you spend time outdoors, and regular examinations of any moles, blemishes or other spots on your skin to identify changes that could indicate malignancy. According to the World Health Organization, more than 130,000 malignant melanomas occur each year, many of which result from excessive sun exposure. Solar radiation can also prove harmful to your eyes. The World Health Organization estimates that 20 percent of all cataracts stem from or are exacerbated by excessive sun exposure, and ultraviolet radiation may increase your chances of other eye diseases as well. To maximize your safety, choose sunglasses that filter out UVA and UVB rays. Phrases such as “UV absorption up to 400 nm” and “meets ANSI standards” indicate that the glasses block up to 99 percent of damaging radiation from entering your eyes. The radiation that can cause eye and skin damage is also harmful to microscopic life. Exposing bottled water to sunlight for six hours or more can kill many harmful pathogens, and developing nations often use this technique as a low-cost method of treating water supplies against common bacterial contaminants. Sunlight has no effect on spores or toxins, however, so you should refrain from drinking suspect water even if you leave it in the sun for a time. Why Is UV Light Harmful? Kazmeyer, Milton. "Beneficial & Hazardous Effects of Solar Radiation." Sciencing, https://sciencing.com/beneficial-hazardous-effects-solar-radiation-19459.html. 25 April 2017. What Are the Dangers of Sun Glare From Snow?